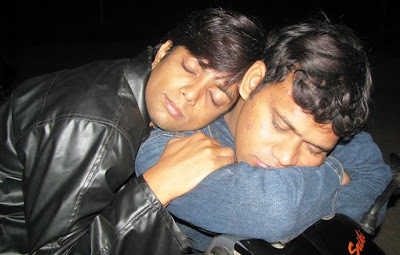 Mr.CONGENIALITY's BLOG: Friends: Rajesh Kumar Sinha. Banda Jitnaa simple... simple utna intro. 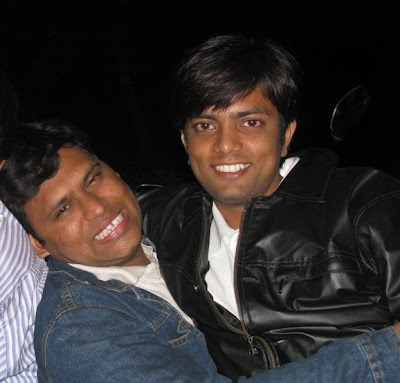 The first person I have seen at HCU who has unexpectedly become a major importance in my life. I still remember when did I first see him. He was with a Mustache ON and it was in GB hall. First person in the list on the admission day. At that moment I never knew that I am probably gonna stay with him in a same hostel, same wing and mostly the same room. He was simple and sober right from the initial days and he still is. That is the best part of Sinha (Sinha ji as venu calls him). I call it destiny and destiny is the only thing which lets you meet people who are away million miles and once you meet them it is worth million lives of bonding. I, rite through the inner layers of my heart cherish the relation with Sinha for the forthcoming lives together. He is too sweet a dude to hang along with. Ok enough of formal positive qualities, let me recollect some lingering memories with him. 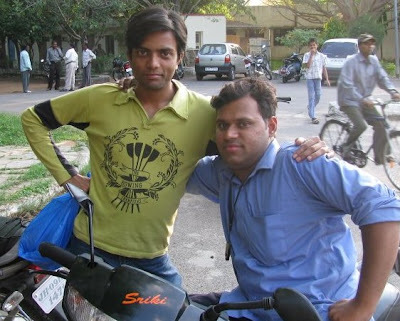 Sinha initially had a cycle and I had a scooty. I was sick driving beside him on the uphill road so.. I used to hold his right hand with my left hand and ride my scooty thus.. both of us reach hostels at same time at same momentum. I now, wish someone had really taken a pic of such a moment. It looks so Bollywood but that was one of the best moments I have experienced. 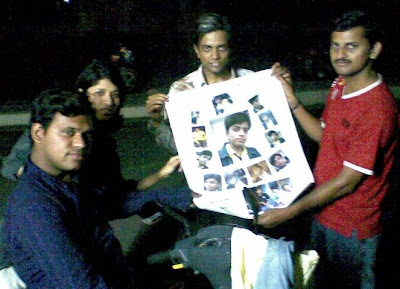 The very group titled 'Family' has bagged lot of memories just because of his presence. The optimal rectangle seating arrangement( Rajesh and Venu in the front row followed by Me and Noopur for copying in exams) was his architecture. He is the one who saved our asses being burnt many times by the Faculty. Sinha learns all week and explains rest in few hours that we can actually go face the Goddamn minors/Majors and assignments/projects at HCU which are sure nightmares for students. He is yet another Dennis Ritchie - a complete leader of C who has understood and corrected my project in hours of time. Thanks for the B in Programming Methodology dude. I just find a drape of tear in my eyes whenever I remember the day when we dragged a Huge Dried tree for over a kilometer for the mid night campfire at the Open Dais. Last minute rush for the Coke for Vasundhra at 12 mid night( After she accepted ki woh mere pair padhengi..). thousands of memories more. I am sure I can write a book compiling all these memories. I have some how used my brain(I am not sure whether I have one??) to be a little creative and present him it. 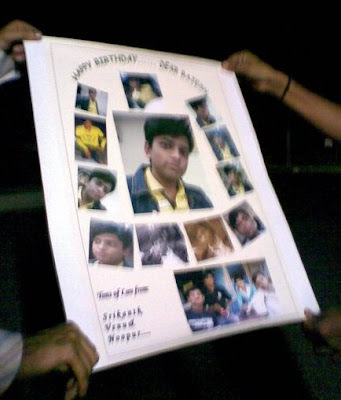 It is a collage of lot of photographs of him which I made it into a poster and packed in 9 layers... which included a Pepe jeans cloth on the top most layer. I am glad that he still preserves it with lot of care in his home. Frankly there is no conclusion for posts like this because relations like this are everlasting and never ending. But to do the formalities I have some words to say to you through this: "Bro, you are absolutely amazing. You have been a real inspiration and support for me. I thank god that I have got people like you and venu are in my life and saaley you pray that you have people like me and aarthi in your life. By the way Guys: I feel so sad to say that Sinha is HAPPILY MARRIED. Yes Happily in bold italics. 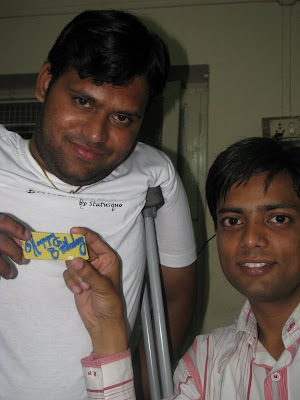 He has got an amazing life partner :beautiful Aarti with a much beautiful heart. 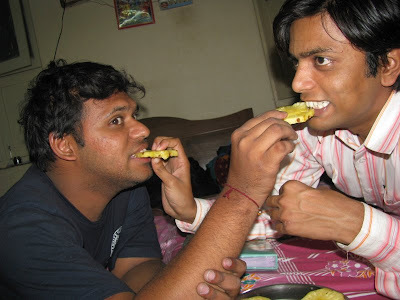 He has got Two Dynamic kind of brothers who will be getting married soon...hehhe.....". 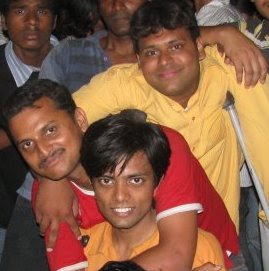 "In the pursuit of my higher academics at Hyderabad Central University I have come across a something like a rock... When I had a keen look at it I found that was a Huge diamond. It is of about 5'7" tall, lean and handsome Bokaro Cut Jharkhand Diamond: Rajesh Kumar Sinha...... Full Respect and loads of love... Please give a Very big Shout and Three cheers to our ultimate,eternal friendship which is travelling towards infinity and beyond..................."
Abey oye.... Kisko bol rahaa hain ye sab.. Mujhe yaa Rajesh ko????? And Thanks for being with me in all my Good times as well as Bad Times. Actually I feel proud to have friend like you in my life. Its like a Life-Time achievement for me. 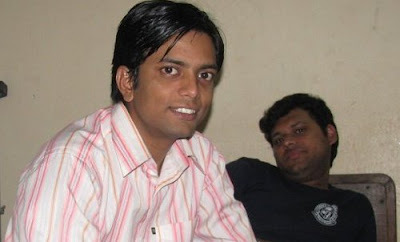 You are an awesome kind of frind Sinha. Love you loads for not what you are. but what I am when I am with you. 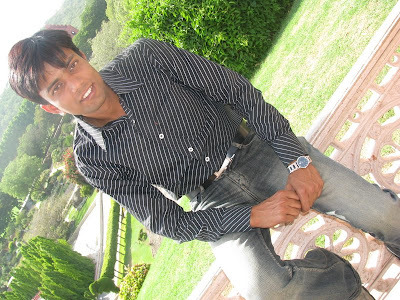 @raghul: Hey thanks for those lovely words. 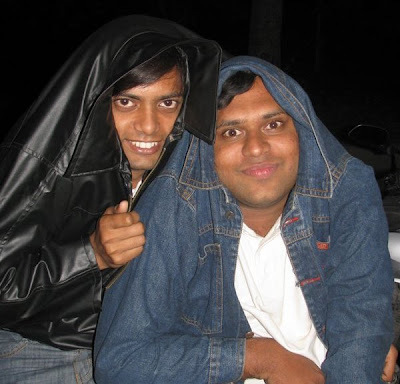 Every friend to rajesh is unique and has their own importance and respect. He has got that multi tasking capabilities. Pretty late a comment but seeing a bond like the one which you guys share even after so many years, it feels so good and so perfect. And having known you both, and getting to see the bond that you two share, i can truly say that it is a relationship made in heaven, and the bond that you guys share is god-like! !